All it took was one versatile haircut, and voila. The seeds for "Warpaint," a nuanced art project addressing the subtleties of gender expression, were planted. The photography series is the brainchild of artist Coco Layne, who, after buzzing the sides of her head, realized that simple changes in the way she styled her hair could impact her own gender representation. She thought particularly about her experiences applying for jobs last year, and how presenting herself as a "more conservative, feminine candidate" helped her land a position at a women's retailer. "I'm a relatively feminine person most days, but I had both sides of my head shaved at the time," Layne recounted in an email interview with The Huffington Post. "Without makeup, I looked more masculine than I did before, and the hair I had wasn't long enough to part down the middle. I ended up wearing a black bob wig and a lot of make up to the interview." She got the job and eventually revealed her real hair to her managers; they were comfortable with Layne's platinum blonde hair split down the middle ("shaved sides hidden, of course"). The job was temporary, but the memory of the way she toyed with gender presentation during that time inspired "Warpaint," a sequential photo series that explores the ways in which small changes in hair styles, makeup and clothing interacted with identity, perception and queer visibility. "I identify as a femme queer woman. On any given day, I fall somewhere on the third or fourth row [of the "Warpaint" collage]," she explained. "Sometimes I'll feel like being super femme and I'll wear a lot of eye make up and lipstick while on other days I won't do anything besides fill my brows in. I love makeup because it allows me to play with my presentation." Layne's presentation changes throughout "Warpaint," moving from a "masculine" hair style, minimal makeup and structure button-down shirt, to what she considers a more "feminine" hairstyle, dramatic makeup and vibrant clothing. The changes in appearance play out gradually in the photos -- only by comparing the first and last tiers can the viewer truly pinpoint differences in each frame. Yet while presentation changes, Layne is quick to point out that her identity does not. "I never felt like I was wearing a disguise at any time [throughout the project]. Although my physical appearance may fluctuate, there's never any behavioral shift with me. 'Warpaint' comes from the perspective of a cisgendered queer woman of color, so it reflects my own unique experience and isn't meant to speak for other queer people, although our experiences may intersect in some ways." "It's important to open up this conversation about gender presentation because its often confused and read as gender identity," she added. "Gender presentation is not about sexual orientation at all! Playing around with gender expression is strictly an avenue to explore my identity as a queer person not my sexual identity." 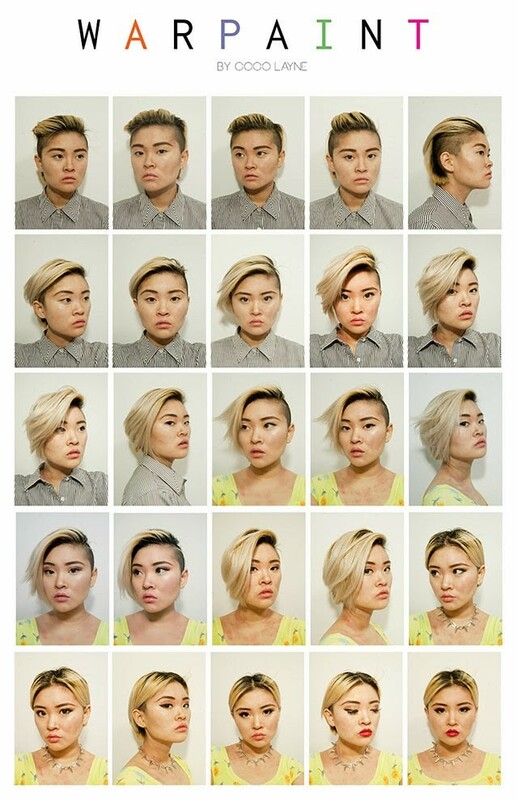 Layne posted the final results of her 20-panel grid of self-portraits to her blog, where it quickly found its way to heavily trafficked sites like Buzzfeed. "I think I learned more from the feedback on 'Warpaint' than from the actual act of creating it," Layne said. "Having this project reach a such wide audience really shed light on how people will cast judgement based purely on appearances." "There's a lot of pressure on how you present your gender on and off the internet," she continued. "I've gotten really interesting comments like 'I stop feeling attracted to her after the twelfth photo even though I know she's the same person.' I struggle with femme visibility and find it a little challenging to have the queer community recognize me to be 'as queer as they are' because of how femme I look sometimes." Aside from gender, Layne was also confronted with critiques addressing her general physical appearance. "I've also gotten a lot harsh comments about my skin. It's ridiculous how some people's perception of beauty is so horribly warped, they think there MUST be something wrong with someone who doesn't have perfect, porcelain skin on the internet, especially with photoshop being so accessible. I am a real person, and real people don't have perfect skin." Despite the negativity, positive feedback has poured in too, and, ultimately, Layne remains excited that so many people have responded to her work. Watch the video below to see "Warpaint" as a stop motion film and let us know your thoughts on the bold portrait series in the comments.